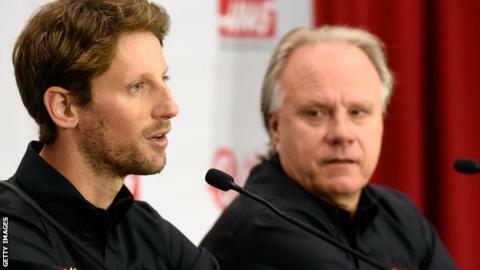 Romain Grosjean will move from Lotus to drive for the new Haas Formula 1 team in 2016, it has been announced. The Frenchman, 29, has been with Lotus for four years and has 10 podium finishes in 78 grands prix. Haas, powered by Ferrari engines, will be the first USA-owned F1 team since 1986. "What everyone at Haas F1 Team is building is impressive, and I'm very proud to be a part of it," Grosjean said. "While I'm committed to giving my absolute best to my current team in these last five races, I am very excited for what the future holds at Haas." Grosjean has made the switch despite the expected takeover of Lotus by Renault. He had been widely tipped to join Haas and his move leaves a vacancy at Lotus/Renault alongside Pastor Maldonado, who recently signed a new deal. The other Haas seat is expected to be taken by former Sauber driver Esteban Gutierrez, who is Ferrari's reserve driver this year. The newly-formed outfit was created by Gene Haas, co-owner of the Stewart-Haas NASCAR team, and while their base is in the USA they will also work out of Banbury in Oxfordshire.